Scotland's Landscapes : Art by Roni B, 2009-2018. All rights reserved. Please don't take my images without asking me first, otherwise you'll be charged £500 + VAT per image, per use. I don't like having to say this, and I know it all sounds rather formal, but unfortunately it's necessary. 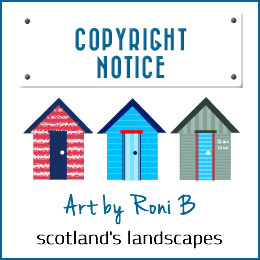 Here goes ..
Any redistribution or reproduction of part or all of the contents of this web site, or of any Scotland's Landscapes hard copy image in any form, is strictly prohibited. You may not, except with my express written permission, download, print, scan, copy, distribute, or commercially exploit either the content of this web site or any Scotland's Landscapes hard copy image. Nor may you transmit or store any of my images, whether in electronic or hard copy format, in any other website or other form of electronic retrieval system. If you'd like to use any of my images on your web site or on your own printed materials, please just ask. Unless you plan on using my images on any web site or document containing illegal or adult-themed material, my answer will always be positive. If you just take an image, either for private or commercial use, without asking or paying, that's theft. For each instance of breach of copyright, an invoice for £500 + VAT per image per use will be issued. Invoices are payable within 7 days of the date of issue. Watermarking has been reintroduced on my web site images to help protect against image theft. Please be assured that no watermark is present on purchased products.